Walmer Castle was built by Henry VIII in the C15, built of massive stone construction facing the beach, with gardens laid out in the C18 surrounding the moat. 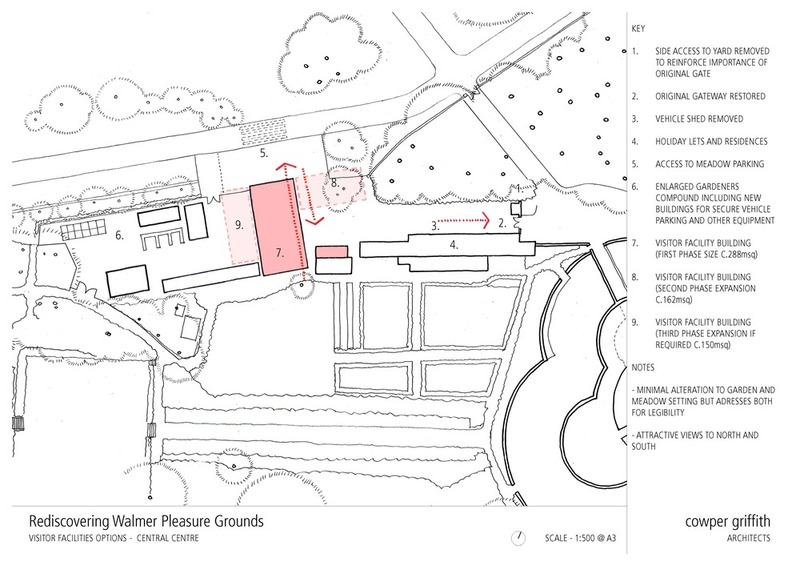 The proposal plans for a new Visitor Facility set on one side of the stable yards outside the castle, and a re-ordering of the gardens including the restoration of the ‘ Picturesque’, a deep Tudor chalk pit, made into a garden in the late C18 and then abandoned. The Visitor Facilities provide for WCs, ticketing, café, volunteer and gardeners accommodation. The restoration of the ‘Picturesque’ garden is both a traditional exercise in garden archaeology, but with the addition of a skywalk running off the edge of the 30m deep pit, high up in the canopy of the mature trees. Our designs exploit the potential for using simple triangulated tubular steel construction in a series of standard curved components, assembled as a serpentine walkway supported on timber or slender steel columns to the forest floor. The steelwork is clad in oak battens forming a curving and variable height handrail, containing nesting areas for bats and birds below the boards, adding to the existing rich wildlife. The prefabricated nature of the design will allow quick assembly and minimal disruption to the flora & fauna below.